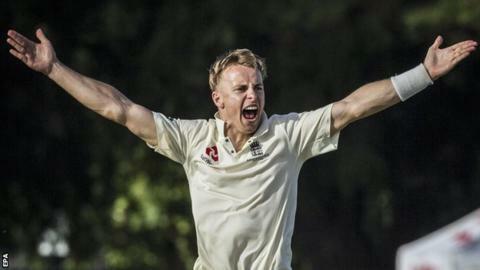 Surrey pace bowler Tom Curran will make his England Test debut against Australia on Boxing Day. The 22-year-old replaces the injured Craig Overton for the fourth Ashes Test at the Melbourne Cricket Ground. “He’s a feisty character and he gets the ball to move around a bit,” said England captain Joe Root. The void left by Overton, who has a fractured rib, could have been filled by fellow fast bowlers Jake Ball or Mark Wood. There was also the option to hand a debut to 20-year-old leg-spinner Mason Crane, but that would have meant changing the balance of the attack. England have decided against making further changes, despite having already lost the Ashes, with Australia holding an unassailable 3-0 lead. “This is the best side to win on this surface,” said Root. “Other guys are looking for form, and looking to turn things round, and they have an opportunity to do that this week. Australia have also been forced into a change as Mitchell Starc’s heel problem has resulted in a recall for fellow paceman Jackson Bird. Born in Cape Town, Curran is the son of former Zimbabwe, Gloucestershire and Northamptonshire all-rounder Kevin. Spotted by former Surrey captain Ian Greig, the brother of ex-England skipper Tony, Curran moved to England to attend Wellington School in 2012. Soon after, his father collapsed whilst jogging and died at the age of 53. Curran remained at Wellington and made his Surrey debut in 2013, qualifying to play for England on residency grounds in 2015. His younger brother Sam, a 19-year-old all-rounder, is also a Surrey regular, while a third brother, 21-year-old Ben, is a batsman who has played for four county second XIs and MCC Young Cricketers. Tom Curran, capped in three Twenty20 internationals and a single one-day internationals, was added to the Ashes squad following an injury to Steven Finn, who himself made the trip to Australia after Ben Stokes was made unavailable. In the tour game against a Cricket Australia XI before the third Test, he served notice of his batting talent by making an unbeaten 77. His bowling is lively, without being express, and contains the variety of a youngster reared on limited-overs cricket. “He’s skilful and a real competitor,” added Root. “It’s a great chance for him – what a great occasion to start playing Test cricket. The build-up to the fourth Test has again involved the trading of opinions, both from within and outside the respective teams. Former Australia captain Ricky Ponting said that Root acted like a “little boy” in the aftermath of his side’s third Test defeat in Perth. “He’s entitled to his opinion,” Root told BBC Sport. “Obviously I think that is a load of rubbish. Meanwhile, England seamer James Anderson said on his BBC Tailenders podcast that Australia’s pace attack has “problems” beyond their first-choice trio of Starc, Josh Hazlewood and Pat Cummins. In response, Starc said he hopes that his replacement Bird “sticks it up” England in Melbourne. And Aussie captain Steve Smith said of Anderson’s comments: “That’s rubbish, to be honest. After losing 5-0 in 2013-14, England are looking to avoid a second consecutive whitewash in Australia and a third in 11 years. The tourists are also on a run of eight successive Test losses down under, having never previously lost nine on the trot. In addition, they are on a losing sequence of seven Tests away from home, dating back to the trip to India at the end of 2016. “It’s been bitterly disappointing that we haven’t been able to get a win yet,” Root told BBC Sport. “The mindset and desire within the team is for us to go and do that. “We won’t be happy until we leave this trip with a win under our belts. We won’t be changing the way we go about things in terms of effort or energy.